The Queen has appealed for tolerance and understanding between cultural and religious groups in Britain's diverse society. She said religions were often in the news as "sources of difference and conflict", whereas they all bore messages of tolerance and respect. She also pointed out that diversity was "a strength, not a threat". The Queen's speech, with footage of her visits to cultural centres, was warmly welcomed by religious leaders. Iqbal Sacranie, secretary general of the Muslim Council of Britain, said the Queen's words carried a "very powerful message". "This is very timely," he said. "It duly reflects British society and that of the Commonwealth in that it shows we are a multicultural society. "The message is very positive and should help promote understanding and social cohesion among different communities in Britain." Rabbi Dr Jonathan Romain, from the Reform Synagogues of Great Britain, said the Queen's speech was "exactly the right message for 2005". "By both acknowledging that religion is often associated with conflict but pointing out that the highest value of all the major faiths is peace, the Queen identified one of the main issues facing the country," he said. He added that the Queen "showed that there is no reason why people from all backgrounds cannot live in harmony". He said: "It was a powerful riposte to those who seek to promote discord between different sections of the community." Christmas is the one time of the year when the Queen writes her speech with no advice from the government. The Queen, who will be 79 in April, warned of the risk that the terrorist threat may have a negative impact on the co-existence of different cultures and heritage in Britain. "We can certainly never be complacent," she added. She went on to praise tolerance and fair play as "strong British values". But she also acknowledged that many challenges still needed to be overcome, and that discrimination still existed. "But there is every reason to be hopeful about the future," she said. "I certainly recognise that much has been achieved in my lifetime," she added. The Commission for Racial Equality said the broadcast "rightly emphasises the importance of greater understanding and integration between different cultural and religious groups". A spokeswoman said the speech had underlined that immigrants' "values are compatible with a very diverse range of cultures - but they may all have to adapt a little to allow those underlying British values to be sustained". The Queen, said that as a Christian she particularly valued the parable of the Good Samaritan, with its teaching that everyone is our neighbour, regardless or "race, creed of colour". But she also warned that the original and traditional meaning of Christmas as "a great religious festival, one of the most important in the Christian year", should not be forgotten. 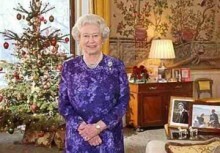 Last year's Christmas speech by the Queen was watched by 6.5m people in Britain alone. The BBC and ITV alternate in producing the 10-minute programme every two years. The theme of the speech is chosen months in advance and an independent TV crew follows the Queen on special events which are later used to go with the script.